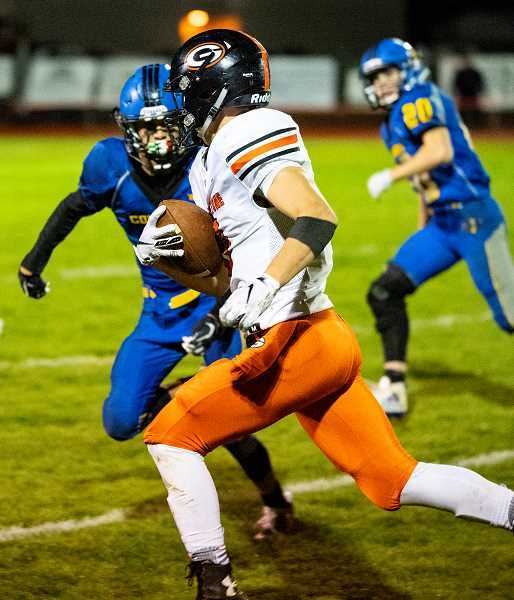 The Gladstone Gladiators rolled into Prineville Friday night and found a way to win, escaping with a 14-6 victory over the Crook County Cowboys. "I'll take a win any day of the week," Gladstone head coach Wayne Harris said following the game. "The thing that bothered me the most is kind of winning ugly. I'm not making any excuses, but these long bus rides and things like that – the kids watch film and then don't take it as serious as they should." Crook County head coach Ryan Cochran was also disappointed in his team's performance and the penalties that the team gave up at key moments in the game. "We had some big ones," he said of the penalties. "They gave them some big first downs, and they killed our drives at costly times. It was hard to move the ball like that. I don't know exactly how many we had, but they were at really key times. We had them off the field. It was third and shut down, and we end up giving them an easy first down." Crook County's Dominic Langley took the opening kickoff inside his own 20-yard line and raced down the sideline all the way to the Gladstone 34-yard line. However, the Cowboys were unable to move the ball, and on third and nine, Cowboy quarterback Brody Connell rolled to the right and attempted to pitch the ball to running back Jacob Kleffner, but Connell's pitch was off target, and Gladstone recovered the ball on the 41-yard line. Following the turnover, the two teams traded punts. 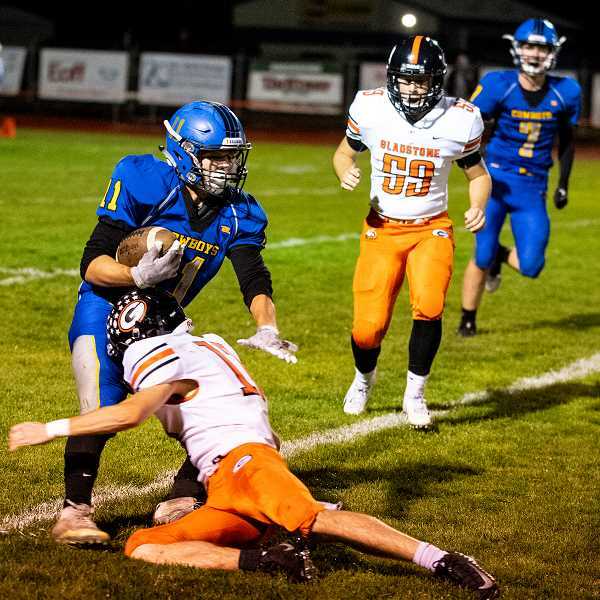 Midway through the first quarter, Gladstone quarterback Jake Gehrke was off target on a pass, and Langley stepped in front, intercepting the ball as the Cowboys regained possession in Gladstone territory. Once again, the Cowboys were unable to move the ball, and after one first down, they punted the ball back to the Gladiators. Connell shanked the punt out of bounds, and Gladstone took over on their own 30. From there, the Gladiators went on a nine-play drive, finally scoring on a 3-yard run by Kalehb Newberry. The kick by Mateo Burgos was good, and Gladstone led 7-0 with 10:11 remaining in the second quarter. After a series of punts, the Gladiators once again moved the ball, but the drive ended with the Gladiators' second turnover of the game, a fumble recovered by Garett Bernard on the Gladstone 44-yard line. However, the Cowboys were still unable to move the ball, and the half ended with the Gladiators still up 7-0. Gladstone took the kickoff to start the second half and drove down the field inside the Crook County 10-yard line, but the drive stalled on the third Gladiator fumble of the game. Mason Scheehean dove straight up the middle with the ball and tried to get some extra yardage after he was hit. Instead, he coughed up the ball, and Crook County's Clayton Berman recovered on the 9-yard line. The Cowboys still were unable to move the ball, and after a Crook County punt, the Gladiators were back in business on their own 37-yard line. Once again, Gladstone went on a time-eating drive, and once again, the Gladiators turned over the ball, this time on a Sebastian Peiffer fumble that was recovered by Hunter Bishop on the 33-yard line. The Cowboys finally started to move the ball, driving into Gladstone territory before a holding penalty and a sack stalled the drive. The Cowboys finally punted, and the ball rolled out of bounds inside the 1-yard line. Gladstone then went on a 15-play, 99-yard drive, eating nearly eight minutes of clock before scoring on a 1-yard quarterback sneak by Gehrke. Once again, Burgos' kick was good, and the Gladiators led 14-0 with 7:37 remaining in the game. "I think that was our best drive of the whole game," Gladstone tackle Jackson Simmons said following the game. "That drive really showed our passion and how we can get down the field and push down there. That really took a bunch of time off the clock and really showed our offenses push and our tailbacks drive." "Any time you can get a drive like that, it breaks the other team's back, so it's just a confidence builder for us, knowing that we can drive down and get points on the board," Harris added. "We are the type of offense where we can kill the clock, we can take long drives and things like that, but then again, you cannot have miscues and turnovers cause everything you worked so hard for it's a wasted rep, it's a wasted drive, it's wasted momentum." 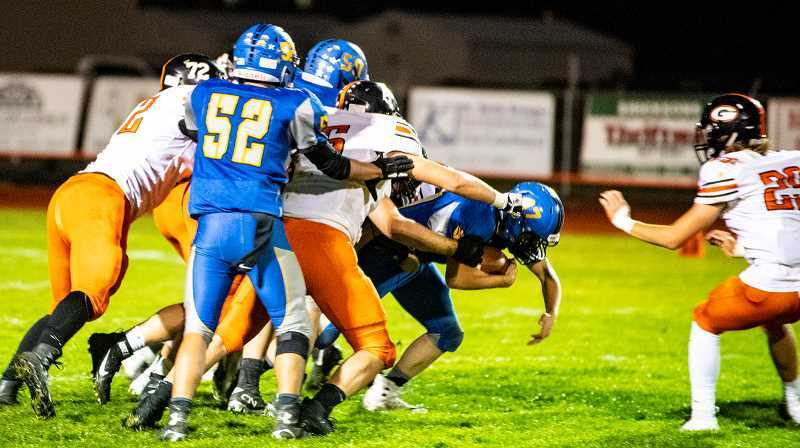 Once again, the Gladstone defense stuffed the Crook County offense. On third and seven, Connell dropped back to pass, but Gladstone flushed him out of the pocket. Scrambling for his life, Connell looked like he would get the first down, but a hard hit dislodged the ball, and Gladstone's Jack Foss recovered the ball on the 45-yard line. That could have been the end of the game, but the Cowboy defense came up big, stopping a reverse to Ben Hill just short of the first down marker on fourth and six. However, Hill came up big on the next series, intercepting a Connell pass and returning the ball all the way to the Crook County 26. After failing to move the ball, Gladstone attempted a 37-yard field goal, but Burgos' kick was off line, and the Cowboys regained possession on their own 20-yard line with less than a minute remaining in the game. Then came the only big Crook County offensive play of the game, an 80-yard bomb from Connell to Langley who raced into the end zone with 55 seconds left in the contest. Connell attempted a pass on the 2-point conversion, but Gladstone intercepted the pass. "I tell you what, our defense played a great game," Cochran said. "They battled all night, and that's a team that moves the ball on a lot of teams, and for the most part, our defense shut them down, so I was super proud of our guys and the effort that they gave. We never gave up, and that is one thing that I was really pleased with is our kids kept scrapping and fighting. But we have to do a better job of executing on offense, they were a good defense, we knew that coming in they had some big bubbas up front and their linebacking core was really good, but we missed some blocking assignments, so that's an execution thing that we have to look at and learn from and prepare for next week." Trailing 14-6, the Cowboys attempted an onside kick, but the ball went harmlessly out of bounds. Gehrke then took a knee three consecutive times, running out the clock as the Gladiators held on for the win. "Crook County, they are a great ball club, and they are great kids. They have to keep their heads up," Harris said. "They always play us tough, so it's nothing new to us. I wish those guys the best of luck." Gladstone's defense limited the Cowboys to just 191 yards of total offense, with 80 of those yards coming on one play. Meanwhile, the Gladiators had 317 yards of total offense with 169 of those yards coming on just two drives. Led by 157 yards on 15 carries by Scheehean, the Gladiators amassed 281 rushing yards in the game. Peiffer added 47 yards rushing on 10 carries for the Gladiators. Meanwhile, Crook County had almost all their yardage from the air as Connell completed 9 of 16 passes for 155 yards. Dominic Langley had five catches for 126 yards for the Cowboys, while Bernard caught three for 24 yards. Gladstone finished with 17 first downs to eight for Crook County. Defensively, Jason Slawter and Berman each had 11 tackles, three assists and a fumble recovery for the Cowboys, while Bishop had five solo tackles, four assists and a fumble recovery, and Dominic Langley added five tackles, four assists and an interception. "The defense played well," said Crook County tackle Caleb Parrott. "They got a couple ones on us, but they definitely had to work for it. It's very disappointing. We have talked about it since day one. We have got to execute and be smart, and there were low points that we weren't smart and didn't use our heads, but we will fix it. We played our hearts out with effort, and it's just cleaning up some execution stuff. We're close to being a really good team." The win improved the Gladiators to 4-2 overall and 3-0 in Special District 2, while the Cowboys fell to 3-3 overall and 1-2 in conference play. "The ultimate goal is obviously to win league," Simmons said. "We will take the win, but we are not going to settle for how we played tonight. We are going to keep going to practice and keep striving for the league championship. That's our goal." G - Kalehb Newberry 3-yard run. Mateo Burgos kick. G - Jake Gehrke 1-yard run. Burgos kick. CC - Brody Connell 80-yard pass to Dominic Langley. Two-point conversion attempt failed.